IN a tongue-in-cheek satire drawn from the melody of a 1960s song, calypsonian Maria Bhola-La Caille fashioned her own version of what took place when the Commissioner of Police recently got sick by blaming his wife. "Tell Gary we love him he cyar die at all, we put prayers on we Facebook wall. But Nicole is you to scold, this false alarm you couldda control. As he wife you making joke, you eh give him something before he leave fuh work. 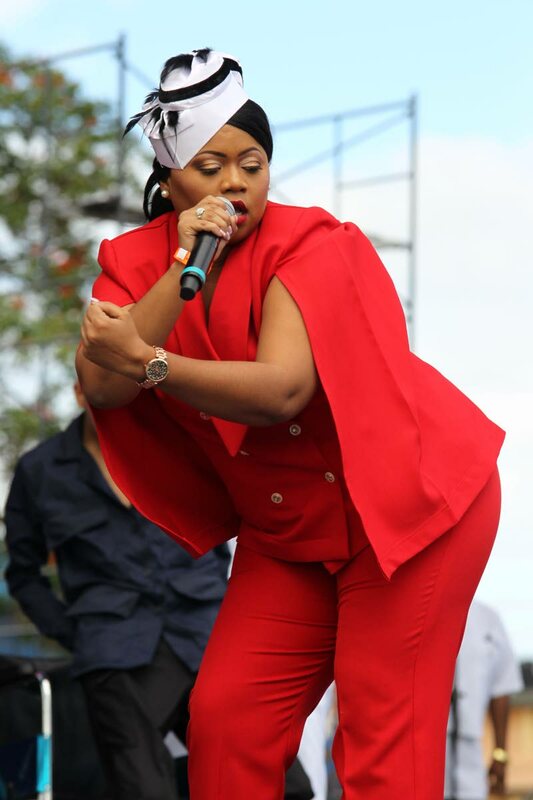 Some ginger tea, two boil eggs, a lil breast or piece of ah leg (sic)," said Bhola-La Caille to an appreciative audience at Calypso Fiesta yesterday. Her song False Alarm has a melody like 1960 classic Tell Laura I love her by Ray Peterson. Hundreds of patrons gathered in Skinner Park, San Fernando, for the semifinals of the Calypso Monarch competition. Known as a frank audience, the patrons walk with signs and objects to show their approval or disapproval of the performances. Luckily, the contestants were not greeted by toilet paper in the first half. Bhola-La Caille’s performance earned loud cheers by the audience, many of whom waved posters with images of Griffith and shouted, "Kaiso, kaiso." Citizens were panicking on hearing "the captain" fell ill and had to be taken to the hospital, she said. This was not the only song that glorified TT’s newest crime fighter, singers professed their love for Griffith and his policing style and shared their perspective in songs and skits. 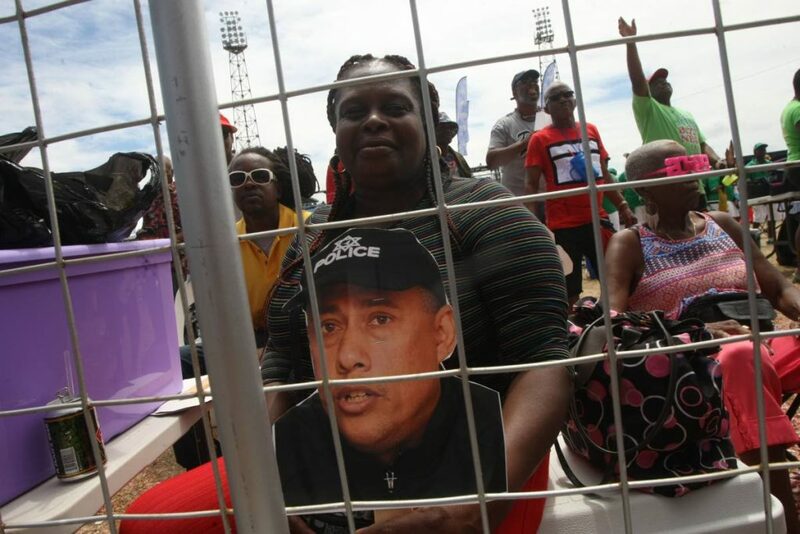 A woman holds a cutout of Police Commissioner Gary Griffith who had a starring role in the songs of many calypsonians at Calypso Fiesta, Skinner Park yesterday. In Heather Mac Intosh’s song Take Over, she warns criminals that "Gary is coming and nobody stopping he." Theme Griffith did not stop there. For Brian London, citizens can call on Griffith for almost anything. In a comical and satirical song titled Who To Call, London said, "If yuh getting horn and doh know who to call, call Gary (sic)." Michael "Sugar Aloes" Osouna summed up the superhero status of Griffith as Super G, noting his lead role in several crime exercises, and the quick rescue of a kidnap victim within hours of her abduction. Veteran calypsonian Winston "Gypsy" Peters performed first with When Elephants Fight, a political commentary about the blame-game by politicians as the poor people suffer. Dressed in the national colours Robert Elias, known as the Mighty Trini, said he is one per cent Syrian and 100 per cent Trinbagonian. That, he said, is what makes him a mighty Trini. For his performance, patrons waved placards one which read, "100% big yard." Another crowd favourite was Karen Asche who satirised the influx of "Spanish coming in by the crates." With Latin music incorporated in the song Loco and Broco, Asche had other concerns including human trafficking and importation of weapons. The Prime Minister arrived just as Asche was about to perform, and patrons gathered around him and other Government officials and took selfies. Nine-time calypso monarch winner Dr Hollis "Chalkdust" Liverpool gave the reasons he would continue to sing until death in the social commentary They Put Meh So. "I singing until I see Al-Rawi lock up a whole political party. They thieving taxpayers money, building houses for their friends and family fixing up nana and nanny." The crowd roared when he told them the Lord "put Eric Williams to write history, Sabga and Aboud to make money and Obama was born to think clearly and Moonilal to eat roti." He said he intended a new song for the finals about "how Watson Duke thief Rowley’s sandals. "But Tuco tell me no, they want one kaiso." Terri Lyons sang Woman an empowerment song in which she praised women. She referred to women as winners and strong people who should not take motherhood for granted. In an energetic performance Selvon "Mista Shak" Noel had patrons waving forks as he sang J’Ouvert Demons. With a fork in his hands, he threw picong for "devil politicians" whom he accused of mashing up the nation. Reply to "‘SUPER G’ OF KAISO"